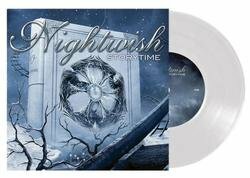 NIGHTWISH - STORYTIME (10” VINYL) | Online Shop | Wizard LTD. The songs for the album were written during 2008-2010, majority of them after the “Dark Passion Play”-world tour ended in September 2009. “Ghost River” is the earliest song while “Song Of Myself” was the last one finished”, remembers Mister Holopainen clearly. “Marco provided the music for ‘The Crow, The Owl And The Dove’, all the other songs and all lyrics are written by me. It was an enormously fun challenge to write songs to a story and visual images, I already had in mind. It was like creating a soundtrack to a movie which didn`t exist. Our long-time engineer Tero ‘TeeCee’ Kinnunen and me then rented a house in Porkkala, Finland for two weeks in April 2010 to record a rehearsal tape for the other band members to listen to.” The summer of 2010 was reserved for band rehearsals and arrangement process. “For this we rented a summer camp called Rosko in my home town of Kitee”, tells Tuomas. “During those two months we raised the songs to a level everyone was happy about and recorded a demo. This enabled Mr. Pip Williams to start working on his orchestral and choral arrangements. For the next four months, he would be doing nothing but arranging those parts for `Imaginaerumґ. The drum recordings started in October 2010, followed by guitars and basses. In February 2011 we entered Angels Studios in London to record the orchestras, choirs and ethnic instruments. This was followed by the keyboard, piano, celtic instruments and vocal recordings in Petrax Studios, Finland.” The mixing process started in April under supervision of Mr. Mikko Karmila in Finnvox Studios, Helsinki, and the first version of the album was finished early in June. “We ended up mixing the album twice more, giving us the final and satisfactory mix in July. The final mastering, engineered by Mr. Mika Jussila took place in Finnvox on the 31st of August. A year of rehearsals and recordings, over two months of mixing and `Imaginaerumґwas finally ready. The audio part of it, at least.